Following the opening day of a conference on “Scholars in Exile and Dictatorships of the 20th Century” being held in Prague, I trailed behind a group of international academics as they were carefully led the few blocks from the National Technical Museum to the hotel where “Welcome Drinks” were going to be served. It was a beautiful and sunny day, and it was difficult to mesh the conversations spilling over from all the talk of Nazism, border crossings, emigration and despair with the sights and sounds of people coming out of the park on bikes and roller-blades, eating ice-cream cones or sitting outside of their local pub with an ice cold beer. The only point of contact between these two different universes came with the mention of thirst – a thirst for recognition, a thirst for a homeland and then the non-metaphorical thirst for juice, soda and beer being expressed by the hot but less troubled inhabitants of the 21st century as they made their way home. Click here for an article about the conference and the issues faced by exiled scholars and intellectuals as well as Prague’s role as a city intellectuals left and came to. Photos – 1) Prague-born writer Franz Werfel, who died in exile in Los Angeles on August 26, 1945. 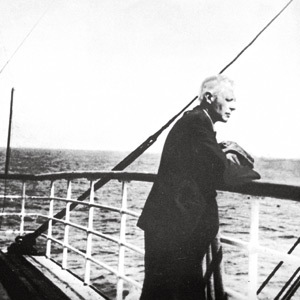 2) Hungarian composer Béla Bartók on the boat bringing him into exile in New York, where he died a month to the day after Werfel.